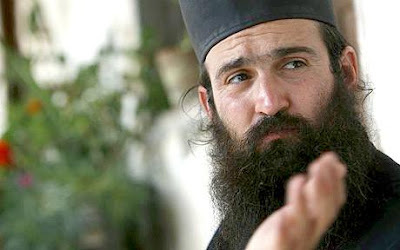 TSURNOGORSKI MONASTERY, Bulgaria (Reuters) - Brother Nikanor, a Nasdaq broker turned monk, advises former colleagues to put a jar with soil on their desks to remind them where we are all heading and what matters in life. As western banks fold into each other like crumpled tickets and commentators portray the current crisis as the last gasp of modern capitalism, Hristo Mishkov, 32, shares the pain -- and offers home truths. 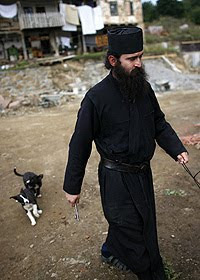 Bulgarian monk Brother Nikanor, 32, stands in front of Tsurnogorski monastery, some 50 km (31miles) west of the capital Sofia, September 24, 2008. The Nasdaq broker turned monk advises his former colleagues, shattered by the financial crisis, to keep a jar full of soil on their desks to remind them about where we are all heading to and what really matters in life. 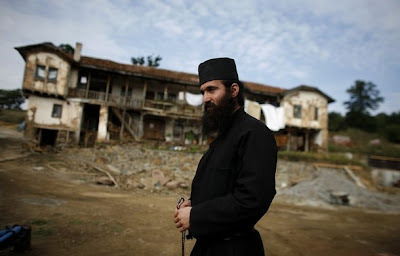 Five years ago, after failing to find happiness in the life he lived, the Christian Orthodox who hadn't practised as a child quit the New York-based market for a dilapidated Bulgarian monastery that once served as a communist labour camp. Picture taken September 24, 2008.